...And Then There Was a Wedding...! But the real revelation was right there inside the front cover! You may remember me mentioning the cookbook Walter’s sister Lizzie had, which was later used by his mother for bookkeeping - how it had information about the school Lizzie attended, which I was able to use to find more schooling information for both she and Walter. Well. 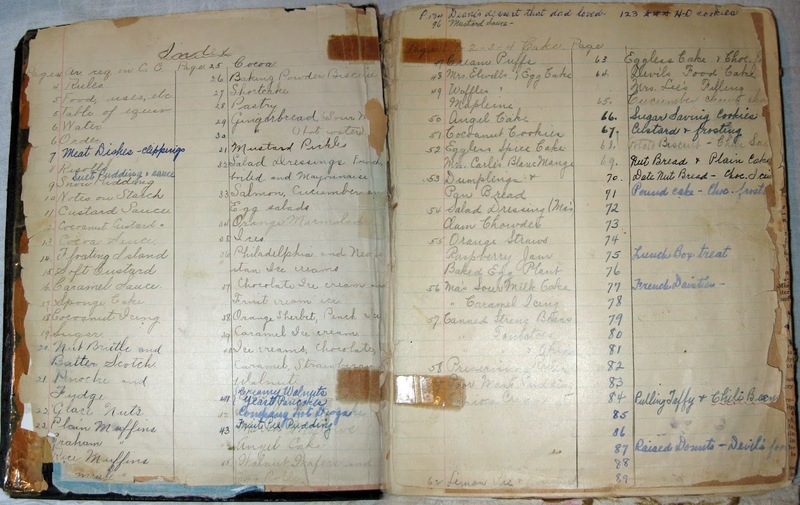 May’s cookbook was also begun in school, “Los Angeles Polytechnic H” (we know that Walter’s brother Fred (Jack) attended Los Angeles Polytechnic High), and May has written a date of 1908; so we know a little more about May's education! Notice on the left side, inside the cover: "The oven test for cake"! My Grandpa (Walter) was a builder! From a very young age, and all of his life, he built homes. And there was nothing ‘cookie-cutter’ about the way he built them! The large home he built for his mother on Aldama was an early Craftsman style home (although the big porch reminds me of the South, where his mother was born and raised); he built many wonderful Craftsman style homes in Eagle Rock (one newspaper account states that he built over 300 homes there! 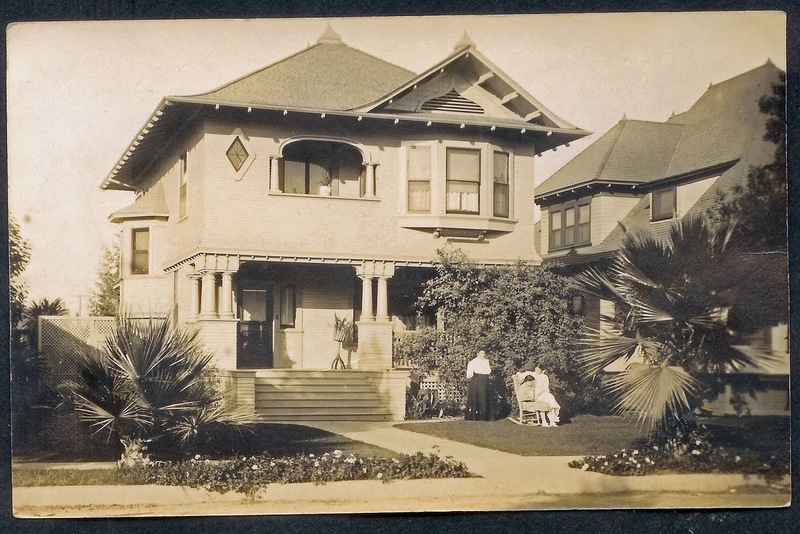 ); when he built in Goodyear Park, providing workers there with homes, they were smaller bungalows; when he built homes in El Monte, they were elegant stucco homes, with soft flowing lines; and when he built homes in Oregon, he used wooden shingles as siding, reflecting the beautiful wood products here. We've been unable to locate this address on current maps. We have located this home; there is a photograph of it on an earlier post. Two more wonderful treasures were shared with me recently! My cousin Tim is the son of Walt Brown, oldest son of Walter. Walt worked alongside his father in many building projects, and was given Walter’s shingle hatchet and finish hammer. Those special items were then given to Tim, who passed them to me. I wish I had taken a photo of Tim holding them. Walt told Tim that Walter used this hammer exclusively, for everything - even 16 penny nails! I do have a photo of my nephew Jay (great-grandson of Walter, and also a builder) alongside Daddy, with the shingle hatchet and hammer. I wonder if Walter used these tools in Portland, so many years ago? As I’ve located newspaper articles about buildings completed by Walter, I’ve begun to feel that he liked to work hard and quickly in completing projects! Once I was doing a Google search for ‘Walter Brown carpenter’ and I found an application being made to declare a wonderful old building in Eagle Rock as being a historic site; and I saw that Walter Brown was listed as the ‘master carpenter’! It was a time-sensitive project, and he met his deadline - in 1914, when he was only 28 years old. 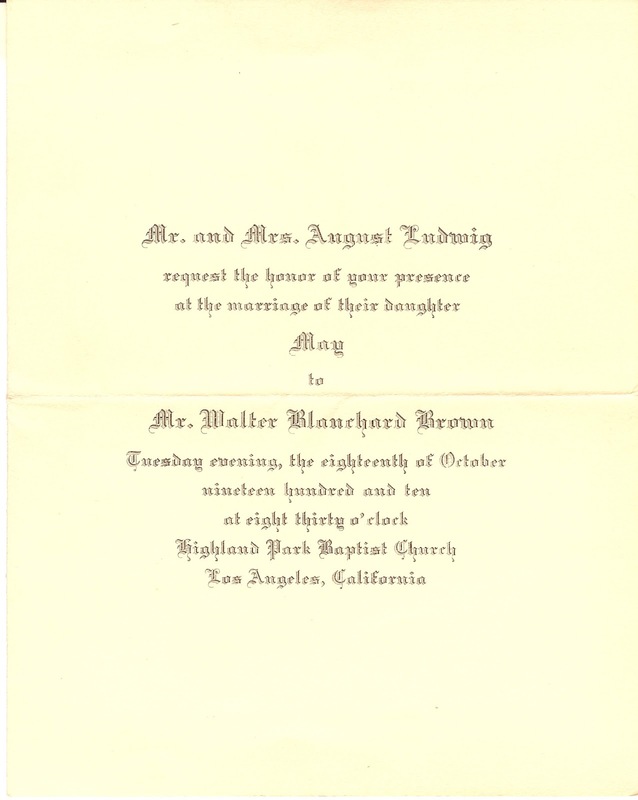 Another search I did revealed some information that I believe may relate to Walter and May’s wedding. 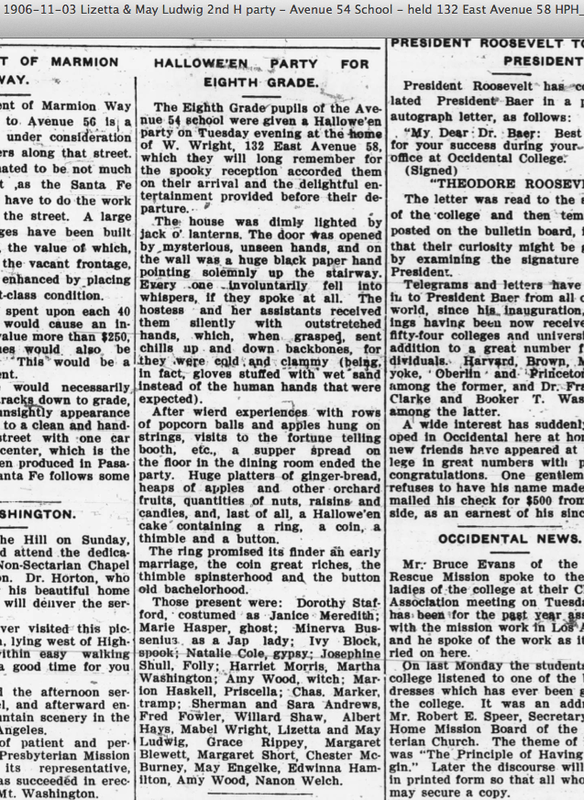 An October 17, 1963 issue of the Highland Park News-Herald and Journal had an interesting article about the history of Highland Park Baptist Church, where Walter and May were married in 1910. 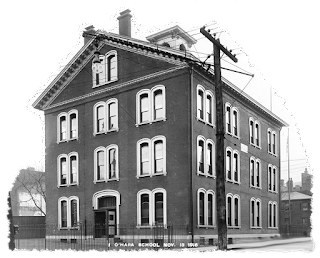 The church originally met in the Presbyterian Church on Sunday afternoons, and was organized in 1907, meeting for a time at the Masonic Hall. 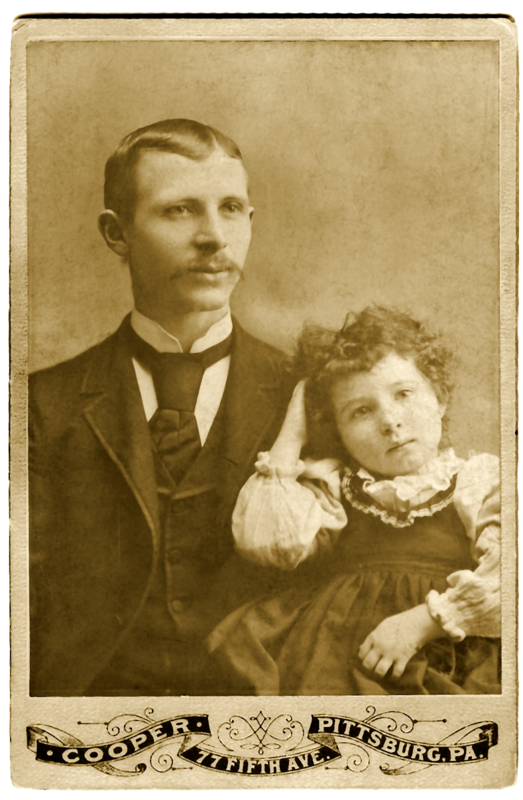 We know by other articles that Walter and May had both been associated with a Sunday school being held in the area for several years prior to that time. 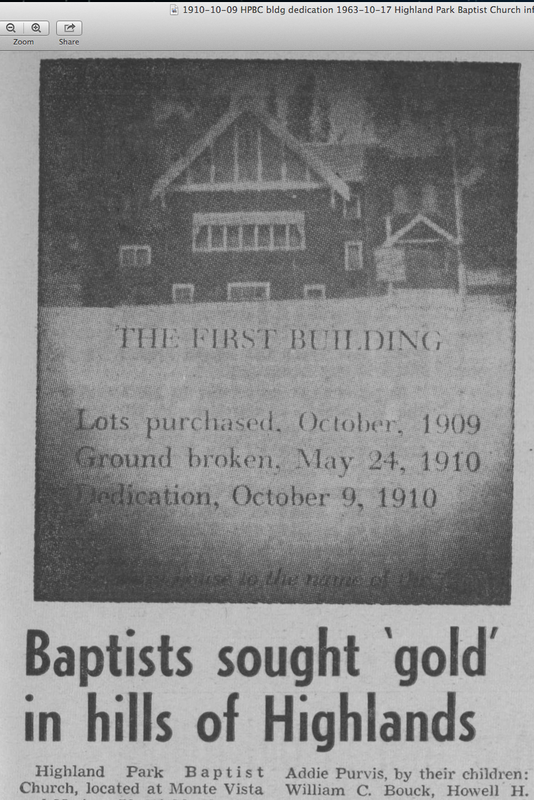 The newspaper article I found had a graphic giving information about construction of the first building: lots purchased, October 1909; ground broken, May 24, 1910; building dedication, October 9, 1910. The builder is not mentioned, but it looks to me like someone who worked hard and quickly may have been in charge of this project! Also significant is the fact that the dedication of the new church building was held on October 9. 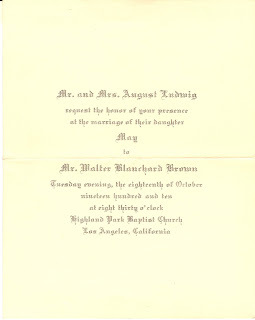 Walter and May’s wedding was held there nine days later, on October 18! In 2016, Steve and I had the privilege of meeting my cousins, Joan Brown Ashcraft and her brother James Brown, at Highland Park Baptist Church; we attended the morning service there together. I took this photo of the inside of the sanctuary (the part of the church built in 1910), but was told that the front of the room was previously the back of the room, so it would have looked differently at the time of Walter and May’s wedding. The marriage license is dated October 17, 1910; the marriage is certified as taking place on October 18, 1910. Walter had been 24 since February; May had been 20 for just one month. The wedding account is very interesting, and mentions family members. If you click on it you will be able to read it more easily. 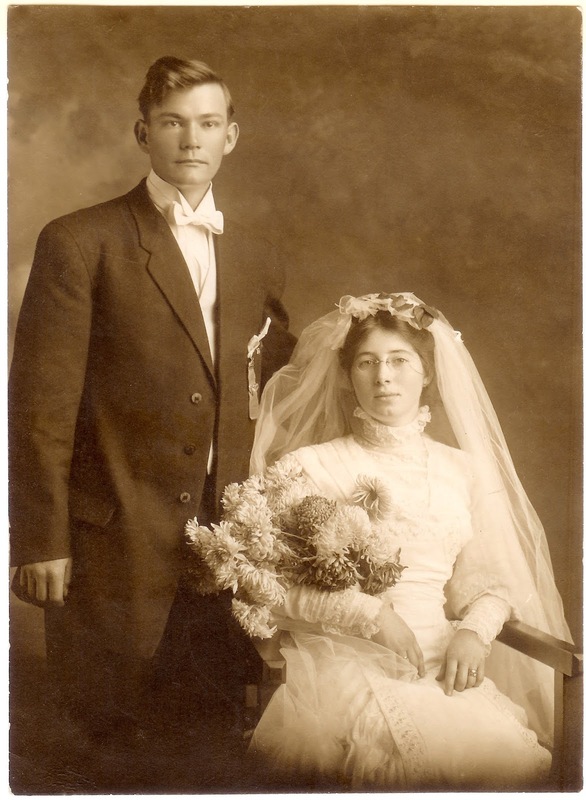 May’s sister Zetta was Maid of Honor; and Walter’s brother Joseph was a Groomsman. 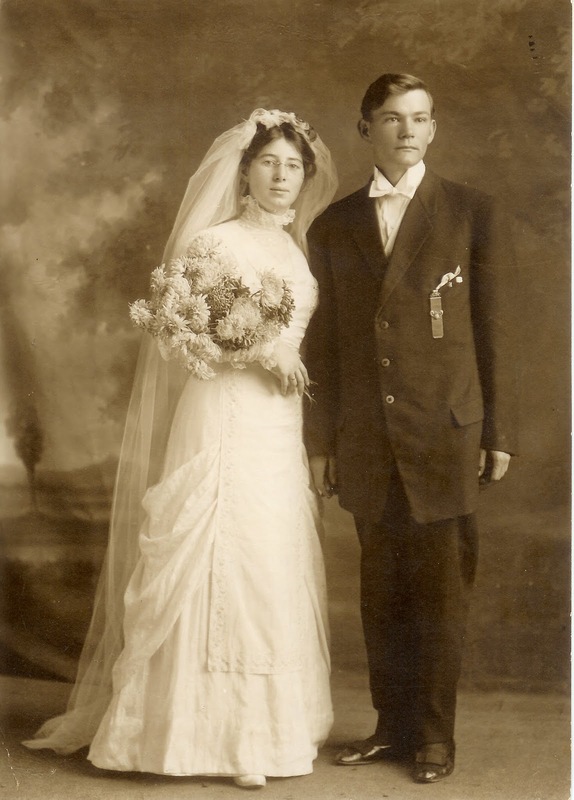 If anyone reading this has a photo of their Brown grandfather and wife, especially when they were young, or of their marriage, I would love to have a copy to share here. I am so glad that we have these photos of Walter and May! 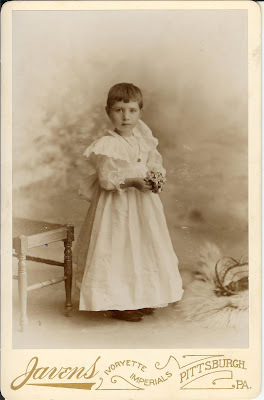 Two notes on the above photo: May created her own gown, on her mother's treadle sewing machine. Also, did you notice how shiny Walter's shoes are? My cousin was told that Walter had previously gone dancing in the evenings [after a long day of hard work!! ], but when he met May, he 'hung up his dancing shoes'! The good news is that they had a lovely new home built by Grandpa to move into and hold their reception in, on October 18, 1910. The bad news is, the home sold four days later, on October 22nd! Well, I guess that was actually good news, since they wanted it to sell; but May kept a list of dates and homes they lived in, and the list is four pages long! Walter built houses; when one house was ‘finished’ enough to move into, the one they were living in went up for sale, and they apparently sold quickly. 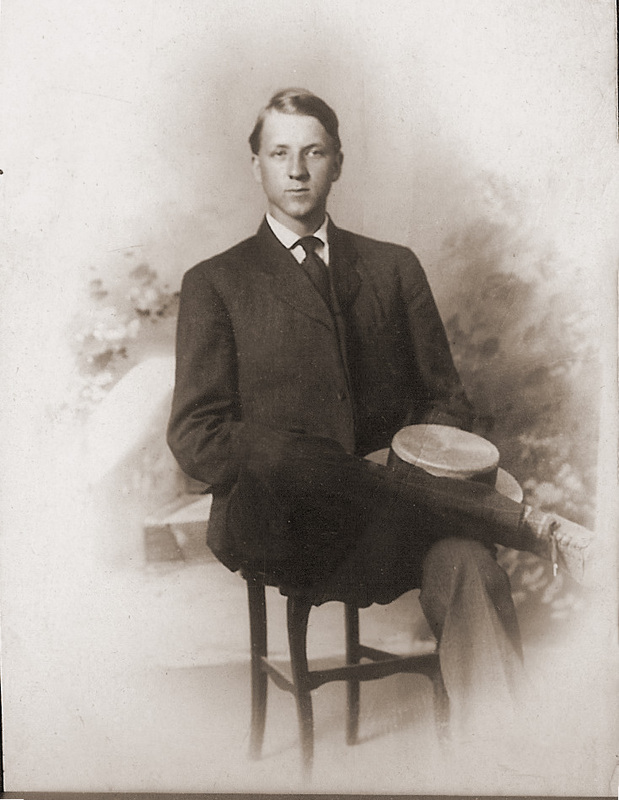 I want to begin to talk about George Eugene Brown, 1856-1909, my great-grandfather; but first I’d like to tell a little more about Walter and May’s family, both their children and their siblings; and a little more about homes that Walter built. And the Old Ranch! And the Canada Trip! And their move to Oregon! Actually, I could write about Walter and May and their family all year, but I guess some of that will have to wait for a book ‘someday’. . . I really am anxious to tell you more of what I've learned about their ancestors! I’m finally back! I’ve been enjoying many fun activities and travels and all, but needing to write a blog post has been in the back of my mind. And, it’s Confession Time again. I confessed earlier that I had to realize that my neat and tidy plan for writing about one ancestor at a time, for one month at a time, was not working very well. Now I have to let go of another part of my original plan! I wanted to tell everything, and I wanted to tell it in chronological order. But I’m realizing something. If I spend too much time worrying about getting everything in perfect order, and somehow including everything, I will never get to tell you all the stories I want to tell! So I’ve decided to just ramble on, and if I remember/find something later, I’ll simply tell you about it when I remember or find it, okay? And, now it’s time to tell you something else before I forget! 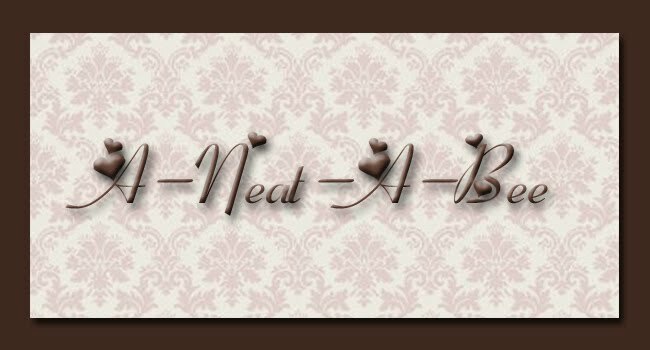 If anyone has something to add, or something to contest, or something to question, or anything at all to say, please email me at the email address I use to send you a link to my blog. I am so happy when I hear from you all! And, I will be delighted to include your parts of the story, here in the blog (with credit given, of course!). In the story of Walter and May’s romance, I included a ‘just finished’ photo of the house that the Ludwigs lived in during the first part of their time in Highland Park, taken before landscaping was begun. That photo was one that our cousin Toni has. I am attaching again a copy of that home taken later, after they were living there. 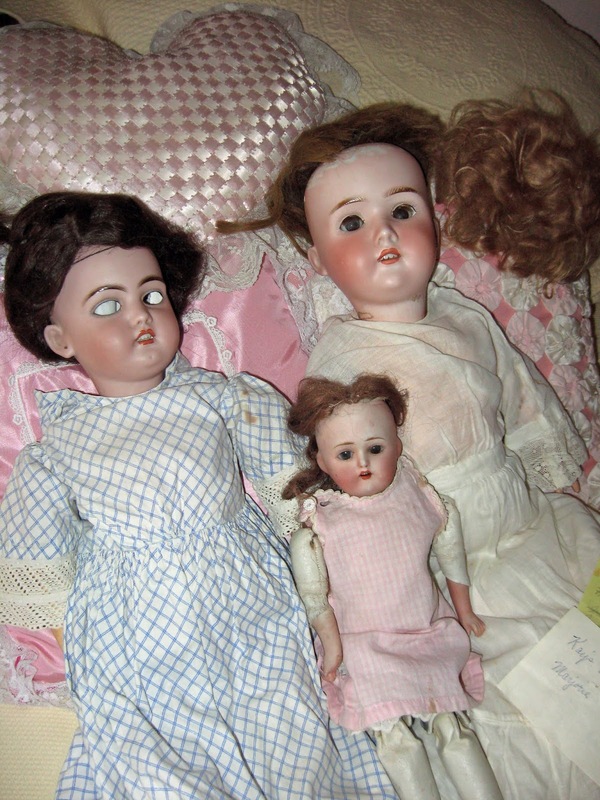 Grandma told me that she remembered playing with paper dolls on the upstairs porch which opened off the bedroom she shared with her sister. We located and photographed that home in 2011; it had been painted a dull beige. When we drove by again on a trip in 2016, it had been updated in red, white, and blue! Note that the tiny palm tree, planted over 110 years previously, has a towering top which makes it look like a telephone pole! We also found a home on that street in Highland Park that was extremely similar to one that we know Walter built (and his family lived in), in Eagle Rock. I will post that photo later. 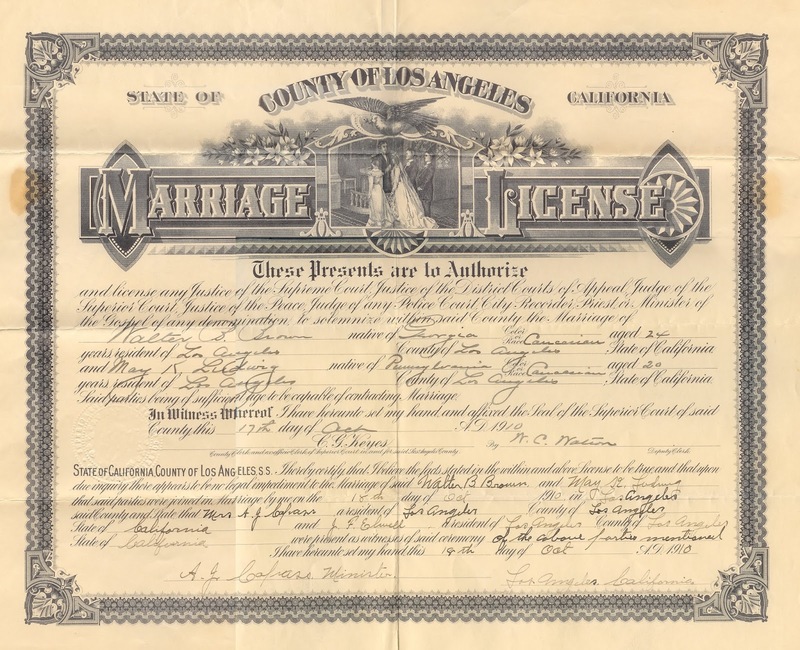 Does anyone feel the urge to research property records in Los Angeles County? Newspaper articles usually say that ‘Mr. ….is building a home’ - which doesn’t tell us who the actual builder is. 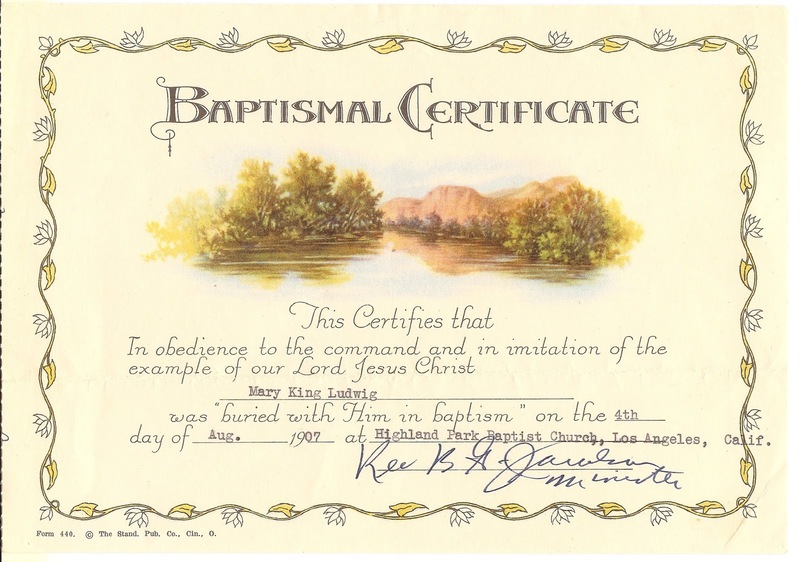 Now we have May in Highland Park, possibly going to school with Walter’s younger brother; and Walter and May are both attending Highland Park Baptist Church, according to various news articles, photos, and a baptismal certificate. Aha!! 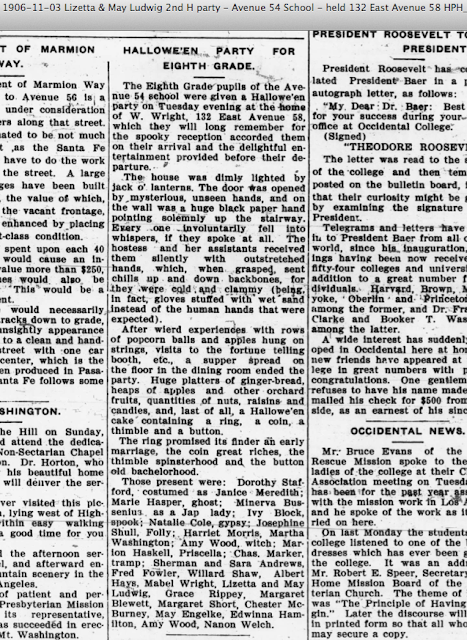 I just realized that this newspaper article describes a party which May and Zetta attended the previous Tuesday evening, for the eighth grade pupils of the Avenue 54 school, held at a home at 132 East Avenue 58 - so they did go to Avenue 54 school, and it sounds like the party was very close to their home at 129 East Avenue 58. May would have been 16, Zetta 13. 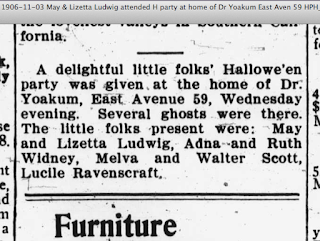 A second article from the November 3, 1906 issue of the Highland Park Herald reveals that the two girls were also present at a party the previous Wednesday evening, at a home on East Avenue 59. 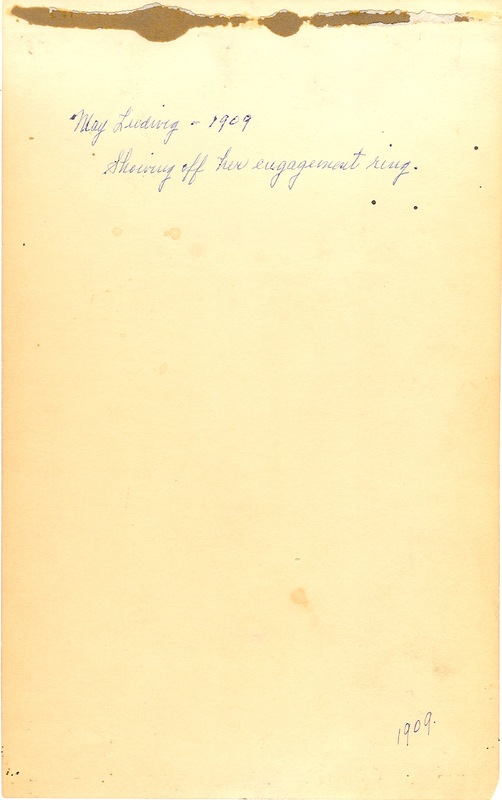 So, in November of 1906 May was included in a list of ‘little folks’; and less than two years later, in August of 1908, Walter was writing to her father, with a declaration of his love for May. Linnea shared that May said she wasn’t ready to marry, that she was just a little girl! 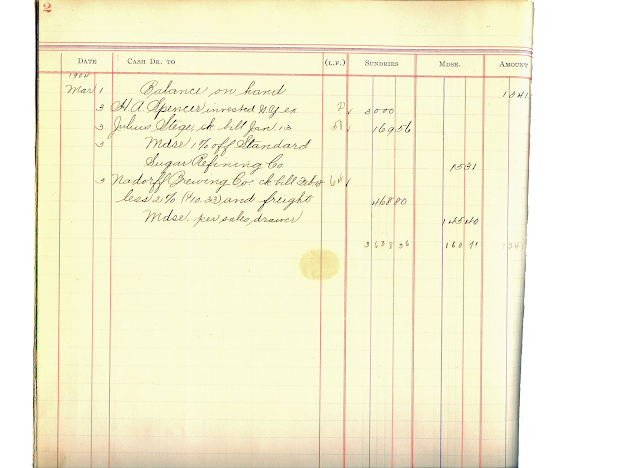 However, by 1909, May is listed in a Los Angeles City Directory as being a bookkeeper for the Vita Manufacturing Company; and her address is shown as 5676 Hub. 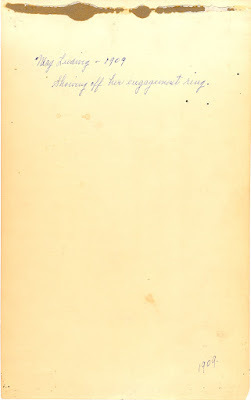 [There is a photo of May and Zetta outside that home, in the post about Walter and May’s romance, with the notation ‘Working days’. 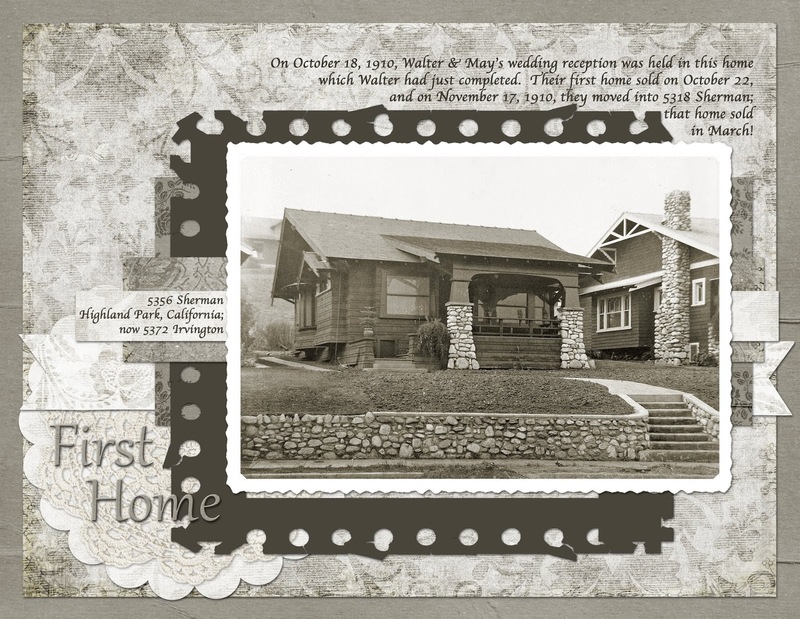 That is the address that Walter was sending letters and postcards to during their engagement.] May was obviously putting her bookkeeping training to good use, working for a company that provided dry batteries. My husband Steve remembers his grandfather (who lived at a remote location where there was no electricity) having a radio that ran by dry batteries. 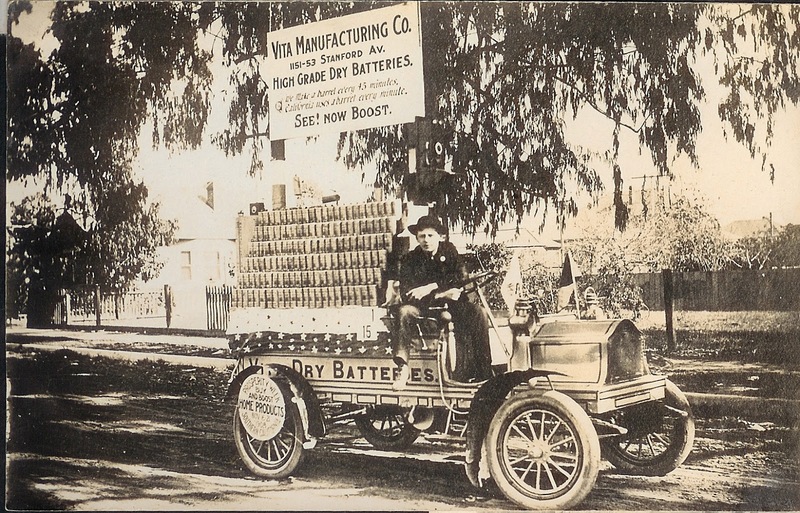 The first photo below has a sign on the wheel referring to ‘Prosperity Week’ during November 1908. Since these photos were in May’s photo album, she was likely working there at that time. Two more photos of May, who was undeniably beautiful! At the time of the census in May of 1910, the Ludwig family, including May and Lizetta, lived on Aldama Street, near the intersection with Baltimore Street. No street number is given on the census, but that would be in the area of 5768 Aldama Street, where Walter built the large home for his mother. 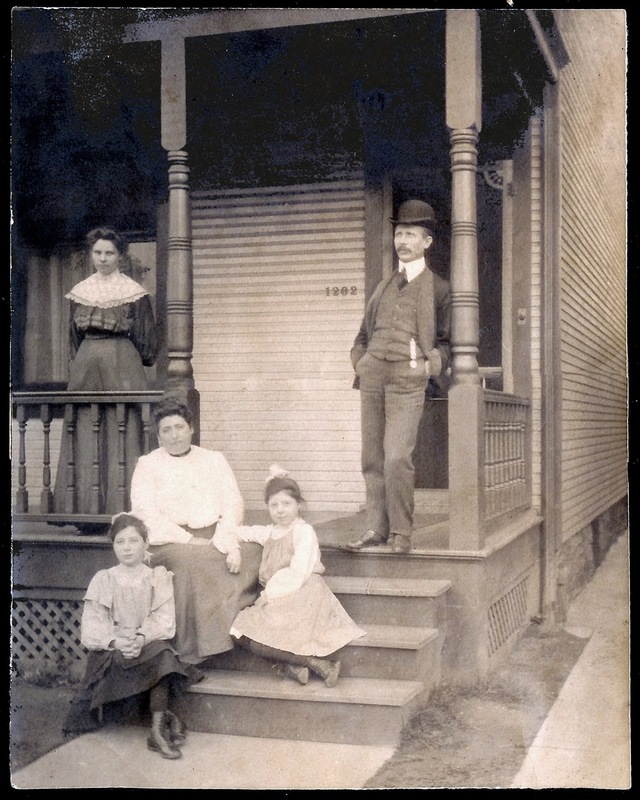 Are you keeping track of all the homes the Ludwig and Brown families lived in? You haven’t seen anything yet! I am so thankful for all those who have allowed me to photograph or scan their photos, or who have sent scanned copies to me! I am part of a private group at Facebook, for the Snellings family. 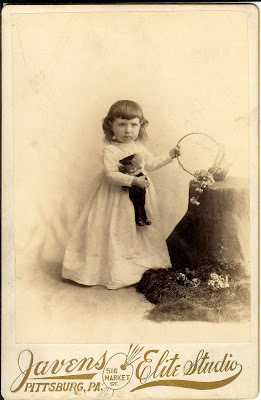 As you will learn in a later post, one of our great-grandmother’s siblings married into the Snellings family; since they are also McMurrain descendants, they have shared a number of wonderful photos of our ancestors, which we would not otherwise have. 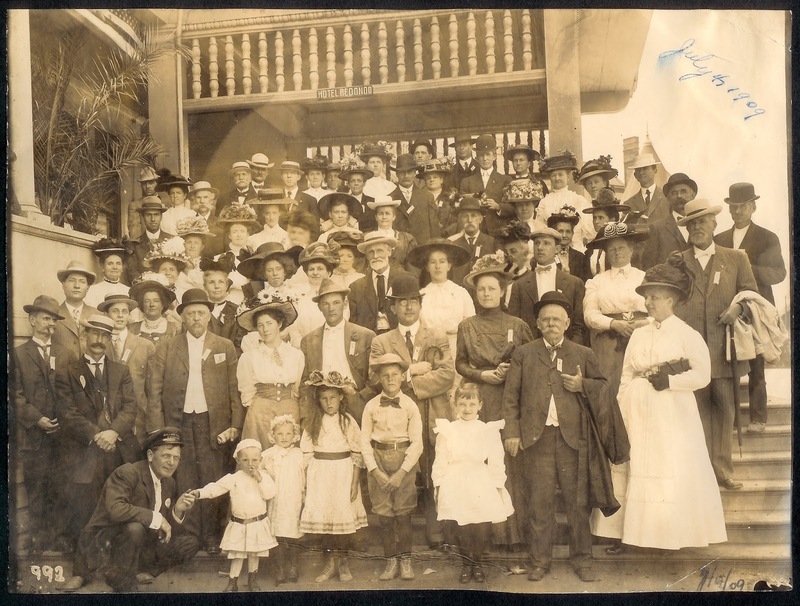 We are very indebted to Frank Snellings for facilitating that group, and scanning or photographing many photos and portraits which he has shared for all of us. 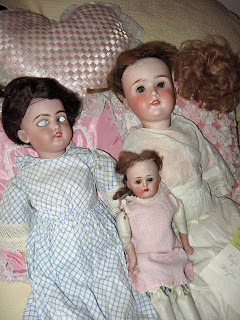 I found things there from our family, things which I would not have otherwise understood or been able to share! Mary Kay Ash had a saying, “If I have an idea, and you have an idea, and we share our ideas - then we each have two ideas.” In a similar way, we now have many more photos and memories to enjoy. If you have photo(s) you would be willing to share, just contact me by email, and we can arrange to make that happen. I do photo-editing, and I love the challenge of restoring old photos! 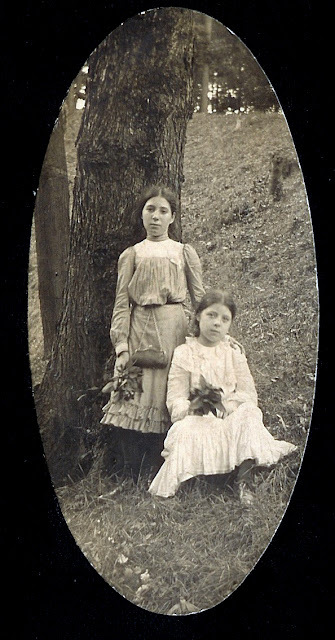 When people share their photos with me, I am able to return a restored copy (digital) as well as their original photo. Since there are not many records to tell us about May’s growing up years in Pittsburgh, I’m glad there are quite a few photographs! The address for the photo studio is given as ‘Pittsburg’ without an ‘h’ on the front of the portrait; but the information on the back side spells the address as ‘Pittsburgh’. 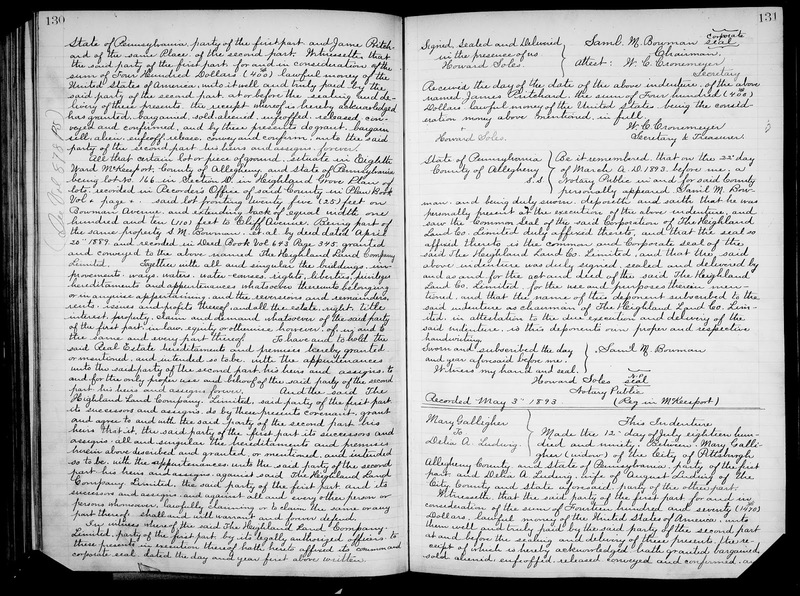 It also states that “duplicates can be had at any time” - but probably not 127 years later! Both of May’s only granddaughters also had scarlet fever - Linnea in 1st grade, and Anita at about the same age. 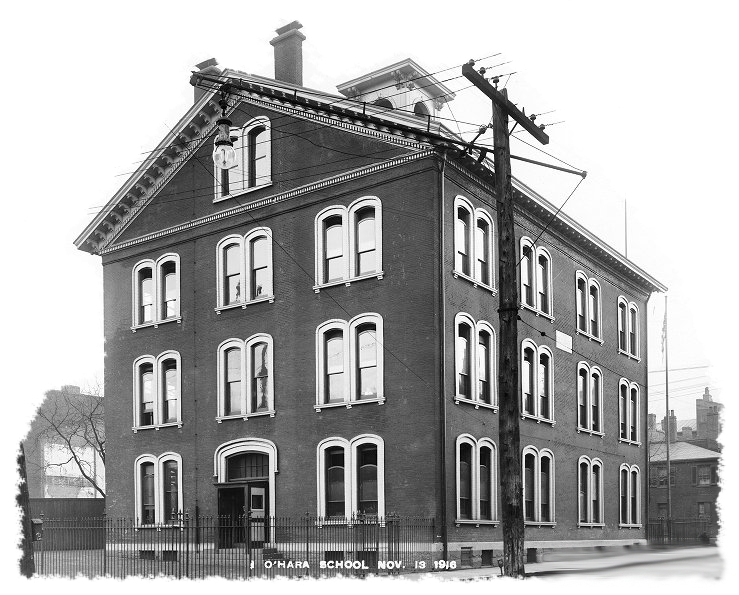 I found that the O’Hara School was begun in 1848, on the corner of 25th and Smallman Streets. It was closed in 1943, and razed in 1944. Since the building is gone, it was nice to find a photo online. In December 1901, when she was just 11 years old, May lost a young uncle in a tragic accident. 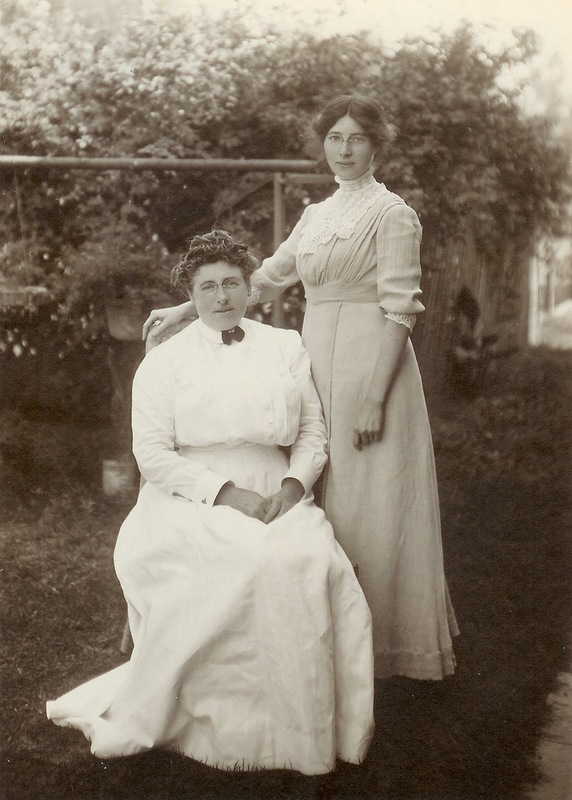 According to a note from May to her daughter, May’s father August “made his first trip to California in 1902” and brought back beautiful fans and lace shawls for his wife and daughters. So the idea of a move to California may have been considered by 1902. I have been unable to confirm any theories about the reason for their move, but I’m glad it was part of God’s plan to bring our grandparents together! 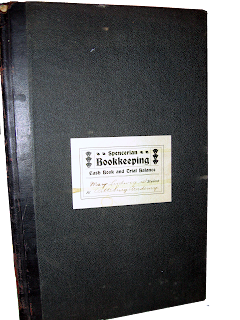 This training prepared May well for a job as a bookkeeper in Los Angeles. Her entries end on March 3, 1904, so it appears that they were still in Pittsburgh until some time after that date. Things may have changed a little in 10 years, but this photo from an 1894 classroom at Pittsburgh Academy is interesting. 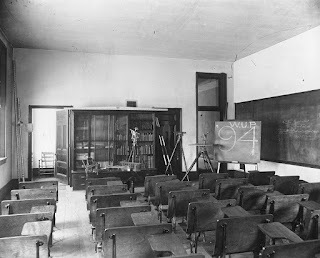 Information I found said that the school was founded as Pittsburgh Academy in 1787, and chartered in 1819 as the Western University of Pennsylvania, so perhaps this is not the same school? I don’t know. Note the house number, 1202. The mystery is this: where was this home located? Who lived here? I’ve had some theories, and I’ve spent hours searching - finding addresses in old City Directories, and then doing ‘Google Map Drive-bys’ - to find a house like this with a street number of 1202. Joanne Cowden has encouraged me to seek the answer through online deeds for Allegheny County, Pennsylvania. I'm anxious to see what turns up! Next week we will find ourselves in California, heading into a building project with a deadline - and a wedding! As I’m getting older (and because I have grandchildren), when I look back at an incident from my childhood I find myself mentally calculating how old my grandparents were at that time. As long as I know how old I was, this is pretty easy. 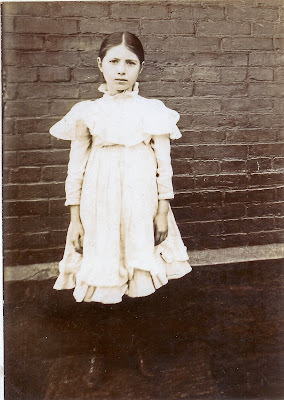 Three of my grandparents were born in 1890, and I was born sixty years later - so I just have to add 60 to my age at any given time during my childhood, and I know their approximate age then. 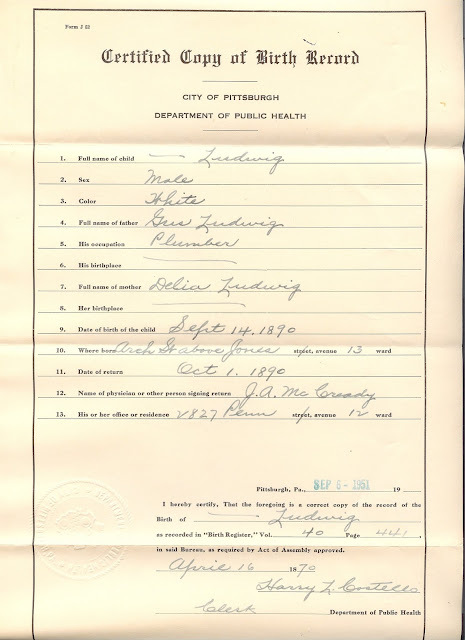 My Grandma (May Ludwig Brown Morgan) was born on September 14, 1890, in Pittsburgh, Pennsylvania, and I have a copy of the birth certificate to prove it. On Tuesday I began to write my blog post and then I decided that I needed to track down some research results from several years ago. I know that I need to implement my system for keeping track of the wonderful bits of information I find. I have a great filing system, and I know what I need to do; but sometimes the hour is late when I stop searching for information; and I end up with a large number of screenshots, stuck in a folder called some variation of ‘name and file’. In the past I have often failed to ever go back to name and file the contents, although I am doing a little better with current research. I did find the files I needed on Tuesday, buried in a ‘name and file’ folder from 2013, with folders inside which I had (fortunately!) given names to - like “Ludwigs in Pittsburgh” (52 files to name) and “Gallaghers in Pittsburgh” (56 files to name) - along with a few others. 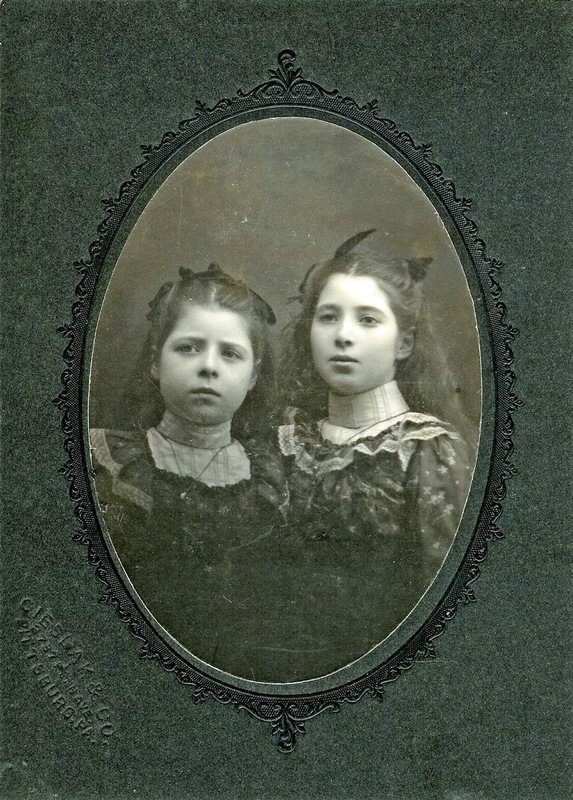 I worked into the evening, and began to see a pattern emerging, as to the whereabouts of the Ludwig family when Grandma was born. When I name items like these, I always begin the name of the document with a year (like "1890-09-12 name and event"), so that when viewed as a list, I automatically have a timeline. I heard my phone ‘pinging’ as I worked, and knew I’d gotten some new emails. When I finished naming the screenshots, I decided to check my email. What a wonderful surprise awaited me there! 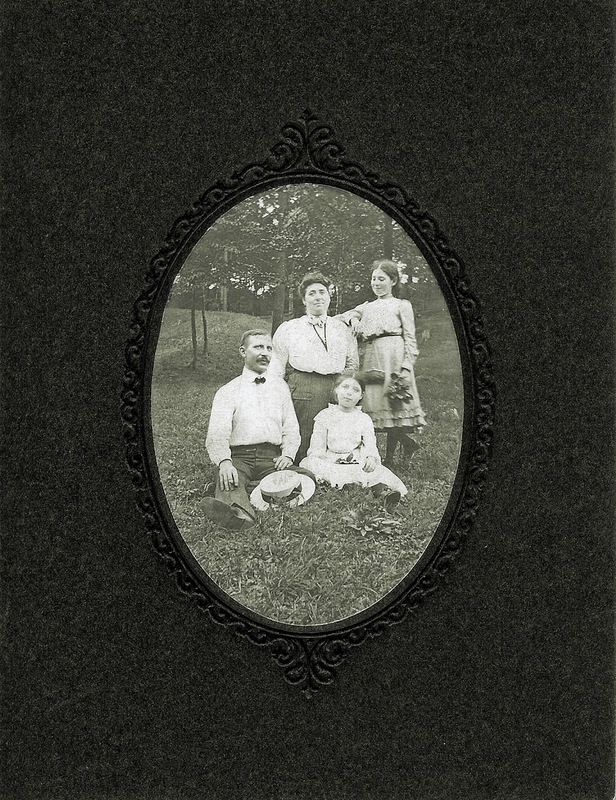 I have been corresponding by email with Joanne Cowden, a genealogist who lives in Pittsburgh, for a little over a year. 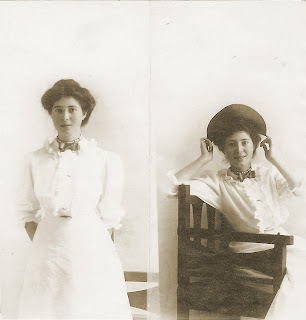 I had benefited from many of her blog posts (at Researching Relatives). 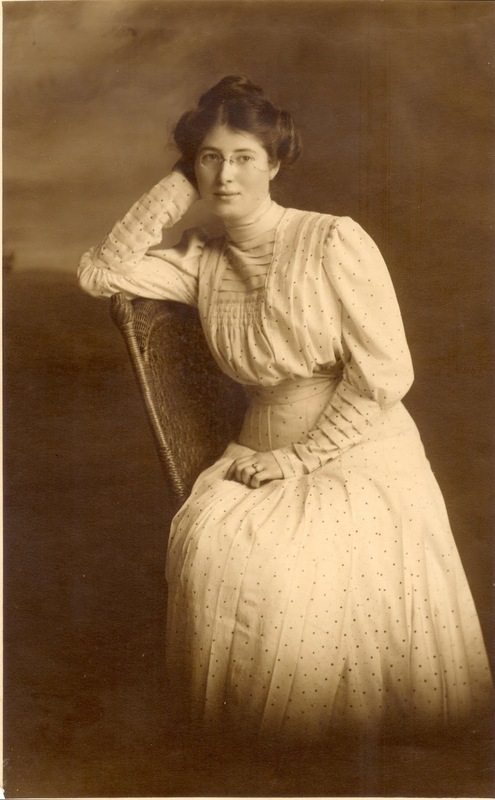 For instance, she once had a blog post which suggesting looking in The Plumbers Trade Journal for information about relatives who had been plumbers in the late 1800’s and early 1900’s - and I promptly followed her instructions and found info on May’s father, August Ludwig! I had recently corresponded again with Joanne. Click on photo to enlarge; begin reading on bottom right of 1st document, bulk of deed continues on 2nd document. I did the ‘genealogy happy dance’ when I saw these! The documents detailed that a home on Arch Street in Pittsburgh was sold to Delia by her mother, Mary Gallagher. 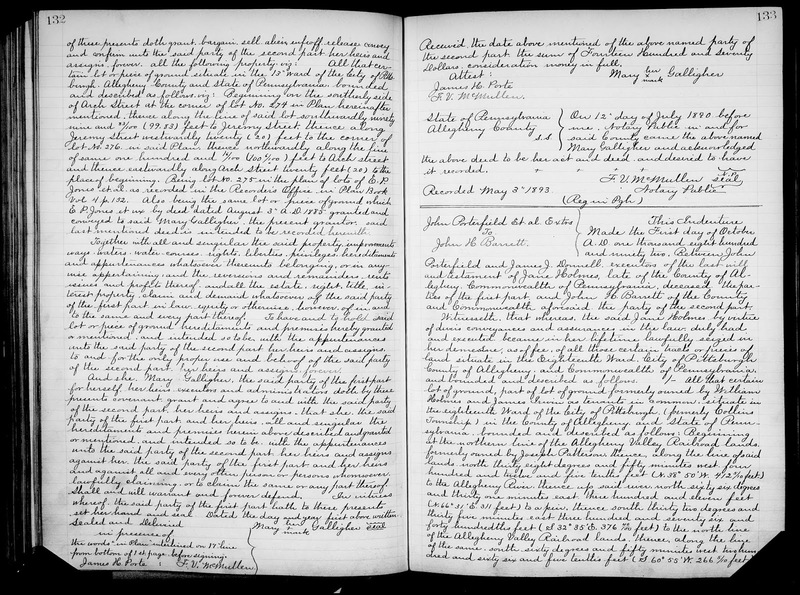 The lot Mary sold to Delia was abt 20x100 feet, with a selling price of $1,470.00; it's interesting to note that the lot description for another sale shown on this document was for a lot 25x110 feet, which listed a sale amount of $400. The name on Lot 276 is "T Gallagher". 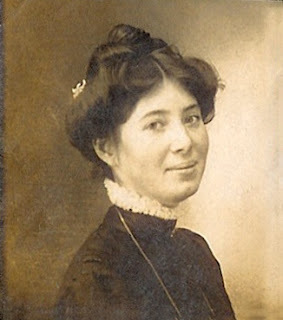 His wife Mary Gallagher later sold lot 275 to their daughter, Delia Ludwig, as seen above. While the omission of Grandma’s name on the birth certificate is disappointing, the location is given, her parents’ names are given, her father’s occupation as a plumber is confirmed, and we learn that he went by “Gus” at that time. 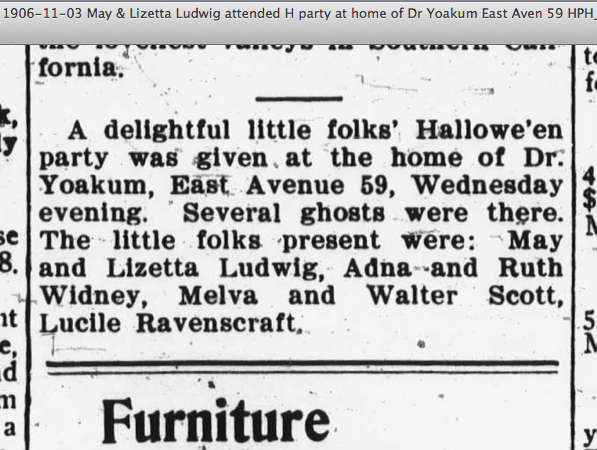 (I am so used to calling him Daddah, but he obviously had an earlier nickname - as did most members of the family!) The address for where Grandma was born (“Arch St above Jones”) makes sense when you look at the above map. You may notice something about this certificate that is not quite right. Have you spotted the glaring error? It appears that Grandma sent for this certificate in 1951, when she was nearly 61 years of age. She must have been bothered by being incorrectly listed as a male! I remember Grandma using a red ‘grease pen’ for list making. She cut up old envelopes, using the blank inside for list-writing, and clamped the lists together with a bull clip, and kept the lists on her kitchen counter. She may have used her grease pen to mark this notice; but that must have been the end of the matter, since we do not have a copy of a corrected birth certificate. What I learned from my labeling of screenshots on Tuesday confirmed the location of May’s home during her early years. 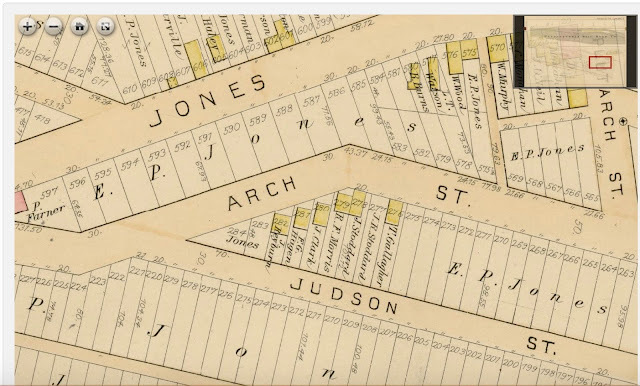 In the Pittsburgh City Directories for 1890, 1891, 1893, 1894, 1896, and 1897, the home of August Ludwig, plumber, is given as Arch, sometimes with the notation “near Jones”. 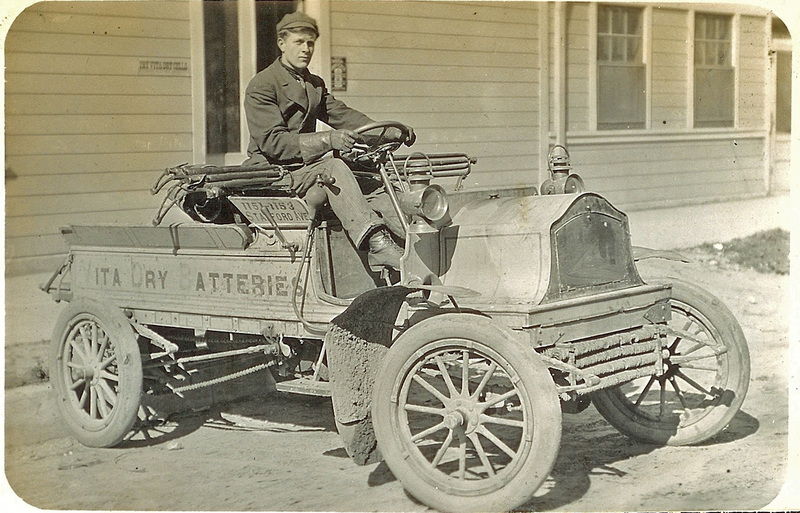 But in 1900, the home address is the same as his business address: 2646 Penn avenue. Grandma was named for her Irish grandma, thus she was named Mary King Ludwig. This was the traditional naming pattern for both Irish and German families - the first daughter was named for the mother’s mother. 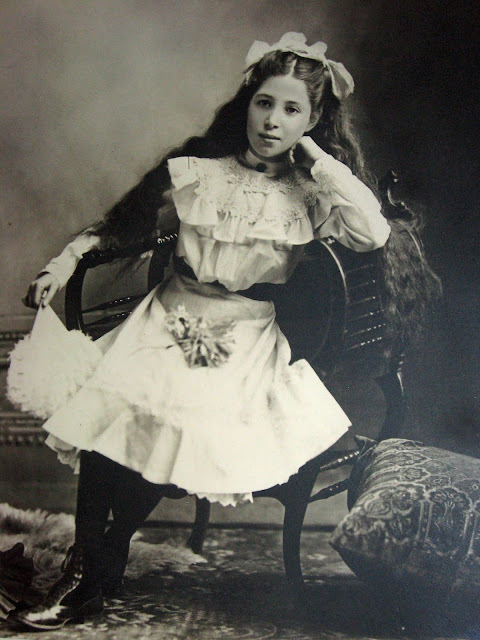 Then, the second daughter was named for the father’s mother; and thus May’s sister was named Lizette, after her father’s mother (Lizzette/Elizabeth Feig Ludwig Schubert). However, she may have had the nickname of ‘May’ many years before that; the Pittsburgh 1900 census lists May, born Sep 1890; and Zetta, born Sept 1893. Now that we know a few details about dates and places and names for May, we are ready to enjoy more photos and stories about her early days in Pittsburgh - and maybe even about her move to California - in our next blog post.